There is a moment when the initiative is being transformed in basement stone of an economic activity. For us, this moment arrived in the year 1999 when we established TAKE STANESCU & Co. Since then, with the same motivation, reliable to the same principles of fairness and seriousness in business, we propose our clients competitive transport solutions. 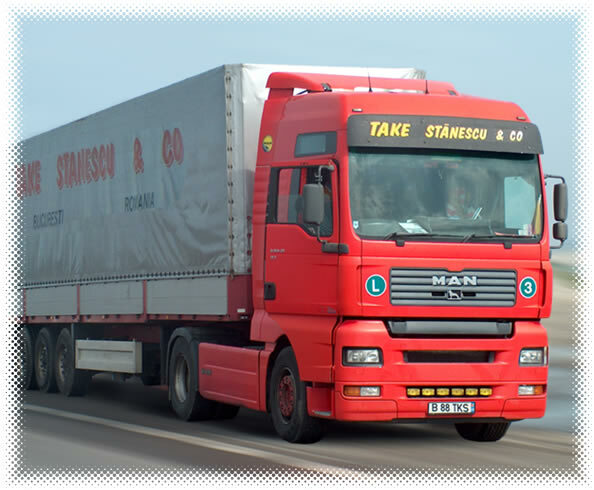 Our company has as object of activity road transport of goods, based on the communitary licence for the public goods route transport Series LTM No. 0035435, issued by the Romanian Route Authority , in the conditions established by the Regulation of the Council (CEE) no. 881 / 92 on the date of 26.03.1992. The company is member of the Romanian Association for International Route Transports since 1999.